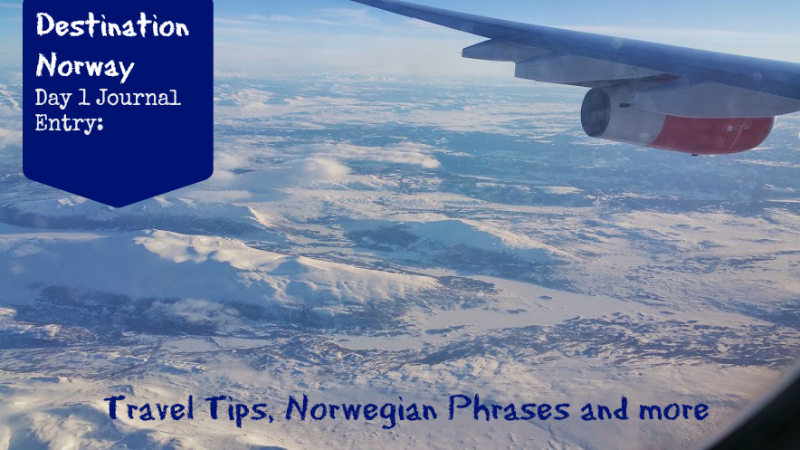 This is journal entry 1 including Norwegian phrases and travel tips. I have embarked upon a 14-day Eurail trip from Oslo, Norway into Bodo, Norway in the Arctic Circle with my six-year-old son ‘The Little’. We are traveling from Sarasota, Florida. We will be stopping for overnights in cities, guided adventure tours, and to explore Viking heritage, the places that inspired Disney’s, Frozen, and Sami culture. These are the Daily Journal Entries from both of us. I woke up precisely one minute before my 6am alarm went off. You know it’s kind of like that when you have a big day ahead of you. Well, today is a big day because today, I am traveling alone with The Little for the first time ever on a 14-day trip through Norway. I’ve already explored my fears and excitement. Today was all about accuracy, efficiency and endurance. We had a 24 hour travel day ahead of us which involved two flights, a club lounge, a train ride and a cab ride to the Thon Hotel Slottsparken in Oslo. I was determined to do it all right with no hangups, plenty of sleep, a decent healthy diet, and lots of fun the The Little. There’s a supervisor’s office near gate 127 and 128 in Terminal C that was nice enough to print a 27 page document for me. There’s a Notary at the United Club Lounge in Terminal C. She’s awesome and didn’t even charge me. There’s no way in heck to overnight anything from the airport (but the hotel we’re at was happy to print the shipping label I purchased on UPS and they are picking it up). When we got to Newark we headed straight for the SAS Lounge at Terminal B where we enjoyed unlimited refreshments, light food, and wine, beer, liquor assortments. There was plenty of places to plug in and get some much needed work done. Travel Tip: Buy your club lounge tickets when you check in online. They are only $30. YOU CAN NOT BUY THEM AT THE LOUNGE. This was going to be a long flight. From 7:55 PM to 8:05 aM. The Little is having growing pains lately and finding it very difficult to sleep. Something I did not want to deal with on the plane. So, I packed a little Benadryl (which I didn’t have to use but was glad to have just in case). Of course I had my peppermint and thieves essential oils for a headache-free and germ free trip. Travel Tip: on a red-eye flight, be sure to go to sleep at any time that allows you to get at least 4 hours of rest. We went to sleep at 10 pm (well The Little did, I suffered a terrible neck ache which I woke up with 3 days prior to leaving). Getting through Oslo Airport, Gardermoen is easy. Once you get through customs just go to the right all the way to the end and you’ll see the Airport Express Train where you can buy tickets. For us, we took the C platform (down the escalator) to City Center where we caught a taxi to the hotel. Travel Tip: You can get to the outside ground level through the bus station. The taxis all take cards and there is NO TIPPING OF TAXIS IN NORWAY! YAY! My favorite parts of the day was hanging out in the SAS Lounge while we waited for our plane. I got to play games, I had cookies and hot chocolate and saw the planes come in. I got to play Minecraft for hours. On the SAS plane, I liked that they had a cup holder and wide isles. Plus they gave me a cool finger puppet and sticker book. I loved the train we took at the airport. It was super fast and had big, big windows. I got to see all the snow as we passed by. Special thanks to Visit Norway USA. While they are funding all air, hotels and meals, this in no way shapes my opinion of my journey through Norway. Do you have any Norwegian phrases you want to add? Or maybe you’d like to fix my pronunciation? Please leave me a comment below! Hahaha if you think that’s funny, you should hear me say them! hmmm, no tipping the taxi man?